The standing rock camp is here to stay and the fight is far from over. 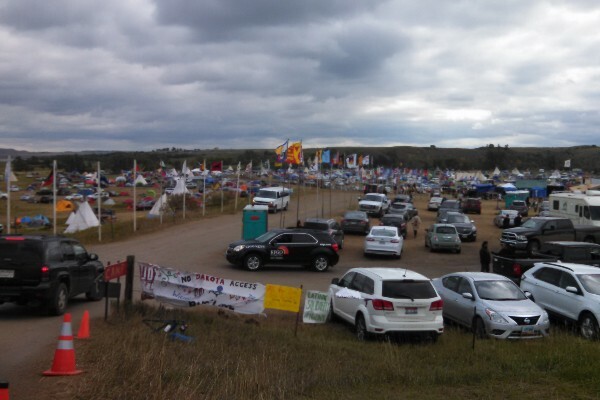 We are at standing rock this week and are fund raising to help buy an army grade tent for the medics at the red warrior camp. Donations we've been given so far have been put to great use and the medics here asked that our next drive be to get them this tent and help them last out the winter. Your impact is important and can make a huge difference! P.S. if we are unable to raise the funds we get before we leave we will put whatever you donate towards shelves and supplies for the medic tent. Thank you so much everyone, your generosity has been breathtaking. The medic tent has arrived at Standing Rock - hopefully we can get a picture of it to you so you can see the work of your donation in action. Together we successfully raised well over 3 times our initial goal, allowing us to buy a bigger and better quality tent, and to ship it to the camp as quickly as possible. The campaign was trending on the GoFundMe site, Bill McKibben retweeted us, 185 people shared the campaign, and 57 of you raised $2095 in just two weeks. Most importantly, though, this tent will make a huge difference to the brave Water Protectors still fighting against the Dakota Access Pipeline on the frontlines of the climate justice movement. Thanks again and don’t forget you can read about our own experiences at Standing Rock at climatejusticeproject.org/blog. Thank you so much to all of you that have already donated. Your generosity has made this effort a tremendous success. The campaign is trending, over 150 people have shared it on social media, and incredibly we have raised nearly 3x the amount we initially asked for. For this reason we are upgrading from the original tent we looked at and buying the red warrior camp the most sturdy and weather resistant medic tent we have found! Since winter is rapidly approaching and the medics need this tent as soon as possible, we are going to pay for expedited shipping. The total cost will come out to $2050, and we are almost there! Any last donations (however small) will be much appreciated so that they can get it within the week. Huge thanks to all who have donated so far! The support we have seen has been staggering and we have raised well over what was needed for the tent. We are purchasing the tent today for the medics and are asking them for a specific list of supplies and infrastructure needed to which we can put the rest of the funds to use. We will keep this GoFundMe open for the rest of the day for any further donations and keep everyone posted on what happens next! Thank you all so much for your donations so far! We changed the goal to $750 to account for shipping (expedited). We are SO close and your donations are making a huge difference. Please share this with your friends. Sending appreciation from Standing Rock. Peter: Using a fossil fuelled vehicle to get to a protest against fossil fuels? And you don't see the inherent hypocrisy in that? Interesting. Boycotting controversial products is normal, except in this instance? Les, you misunderstand. Being dependent upon something doesn't mean you don't see the importance of ending our dependence on that thing. I this case, the good people here are as much protesting the violent destruction of their cultural patrimony as they are the destruction of the planet through the overuse of fossil fuels. Yes, most of us are still forced to get around in vehicles powered by fossil fuel. But we all know this dependency must end, both because there is a limited supply, and because their use is incinerating our planet at an accelerating rate. I see more fossil fueled cars and motor homes, than people, in that photo. Can anyone else see the hypocrisy, albeit unintentionally hilarious? I hope you have a mild winter, may all be healthy. Get your flu shot all of you.